Home //My Practice // Alfred A. Mansour III, M.D. Top Doctors In Texas Rising Stars Recognition As Published In: Texas Monthly, July 2019. Dr. Alfred Mansour is an Associate Professor in the Department of Orthopedic Surgery at The University of Texas Health Science Center at Houston. He is the Director of the UTOrtho Comprehensive Hip Preservation Program and serves as a Team Physician for the Houston Rockets NBA Organization. 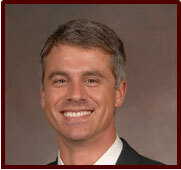 In addition to leading the hip preservation program, he also currently serves as Director of Pediatric Orthopaedics. Certified by the American Board of Orthopedic Surgery, Dr. Mansour completed dual fellowships in both Orthopaedic Sports Medicine and Pediatric Orthopaedic Surgery with an emphasis on the full spectrum of hip preservation. His combined training experiences have shaped his subspecialized expertise and approach to both sports medicine and hip preservation in children and athletic adults. 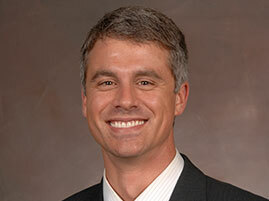 He is one of only a handful of surgeons nationally employing both arthroscopic and open surgical techniques including periacetabular osteotomy for complex hip problems including femoroacetabular impingement (FAI) and hip dysplasia. He also specializes in fractures and growth plate injuries of the extremities, patellar instability, osteochondritis dissecans (OCD), ACL ruptures, and cartilage injuries of the elbow, hip, knee and ankle. Dr. Mansour received his undergraduate degree from Texas A&M University in College Station, Texas, while becoming a seven-time NCAA All-American swimmer and finalist for NCAA National Scholar Athlete of the Year. His experience at the elite level of athletics as a competitor and physician give him a unique perspective in caring for the high-level athlete of all ages. He attended medical school at Louisiana State University Health Sciences Center in New Orleans, Louisiana. He completed both his internship and residency at Vanderbilt University Medical Center in Nashville, Tennessee. Dr. Mansour went on to complete a fellowship in Pediatric Orthopaedic Surgery at Children’s Hospital Colorado and an additional fellowship in Sports Medicine from the prestigious Steadman Hawkins Denver Clinic, serving as an assistant team physician to the Denver Broncos Football Club and Colorado Rockies Baseball organization. Dr. Mansour is a member of the American Academy of Orthopaedic Surgeons, the American Orthopedic Society for Sports Medicine, and the Pediatric Orthopedic Society of North America, where he serves on multiple national committees. He has been recognized by H-Texas Magazine and Houstonia Magazine multiple years as one of the “Top Doctors” in Texas in both pediatric orthopaedics as well as sports medicine. His research interests include various areas of sports medicine and hip preservation and he has presented at a multitude of national meetings. He has numerous publications in a variety of orthopaedic journals and frequently lectures on the topics of hip preservation in adolescent and young adults, pediatric sports medicine, and trauma. 2001 - 2005 Louisiana State University Health Sciences Center New Orleans, Louisiana M.D. 2010 - Present Colorado – M.D. 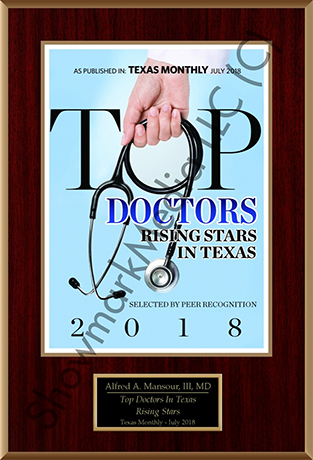 Top Doctors In Texas Rising Stars Recognition As Published In: Texas Monthly, July 2018. Top Doctors In Texas Rising Stars Recognition As Published In: Texas Monthly, July 2017. JBJS Residency Enhancement Journal Club Grant. Principal Investigator. July 2009 to June 2010. $2,000. (Completed peer-reviewed grant support). Lalonde, J., Rabalais, R.D., Mansour A., Burger, E.,Riemer, B., Lu, Y., and Baratta, R.: New Tension Band Material for Fixationof Transverse Olecranon Fractures: A Biomechanical Stud. Orthop.28(10):1191-4, 2005. Rabalais, R.D., Burger, E., Lu, Y., Mansour, A., andBaratta, R.: Comparison of Two Tension-Band Fixation Materials andTechniques in Transverse Patella Fractures: A Biomechanical Study. Orthop.21(2):128, 2008. Mansour, AA 3rd, Even, J.L., Phillips, S., and Halpern, J.L. : Eye protection inorthopaedic surgery. An in vitro study of various forms of eye protectionand their effectiveness. J. Bone Joint Surg. Am. 91(5):1050-4, May 2009.doi: 10/2106/JBJS.H.00460. Nyman, J., Munoz, S., Jadhav, S, Mansour A., Yoshii, T.,Mundy, G., and Gutierrez, G.: Quantitative Measures of Femoral FractureRepair in Rats Derived by Micro-computed Tomography. J. Biomech.11;42 (7):891-7, May 2009. Magnussen, R., Mansour, A., Carey, J., and Spindler, K.:Meniscus Status after ACL Reconstruction is Associated with the Presence ofRadiographic Signs of Osteoarthritis at 5-10 Year Follow-up: A SystematicReview. J Knee Surg. 22(4):347-57, October 2009. Mansour, A., Block, J., and Obremskey, W.T. : A Cadaveric Simulation of Distal FemoralTraction Shows Safety in MRI. J. Orthop. Trauma 23:658-662, October 2009. Mansour, A.A. 3rd, Kelley, M., Hatmaker, A., Holt, G., and Schwartz, H.: Verification ofMusculoskeletal Findings on FDG-PET-CT Scans Performed for MelanomaStaging. Ann. Surg. Oncol. 17(4):1144-51, April 2010. Mansour, A.A 3rd, Wilmoth, J.C., Mansour, A.S., Lovejoy, S.A., Mencio, G.A, and Martus,J.E. : Immediate spica casting of pediatric femoral fractures in theoperating room versus the emergency department: comparison of reduction,complications, and hospital charges. J. Pediatr. Orthop. 30(8):813-7,December 2010. Kinkartz, J., Mansour, A., and Noonan, T.:Post-arthroscopic Elbow Chondrolysis after Continuous Intra-articularRopivacaine Infusion. J. Shoulder and Elbow Surg, 21(11):e1-e5, November2012. Mansour A., Watson, J., and Martus, J.: Displaced Dorsal Metaphyseal CortexAssociated with Delayed Extensor Pollicis Longus Tendon Entrapment in aPediatric Smith’s Fracture. J. Surg. Orthop. Advances, 22(2):173-5, Summer2013. Mansour, A., Genuario, J., Young, J., Murphy, T., Boublik, M., and Schlegel, T.:National Football League Athletes’ Return to Participation followingSurgical Reattachment of Complete Proximal Hamstring Ruptures. Amer. J.Orthop. : 42(6):E38-E41, June 2013. Mansour, A.,Ballard, R., Garg, S., Baulesh, D., and Erickson, M.: The use of barbedsutures during scoliosis fusion wound closure: a quality improvementanalysis. J. Pediatr. Orthop. 33(8):786-90, December 2013. doi:10.1097/BPO.Ob013e3182a11eee. Mitchell, J.J.1, Sjostrom, R., and Mansour A.A., Irion, B., Hotchkiss, M., Terhune, E.B., Carry, P., Stewart, J.R., Vidal, A.F., and Rhodes, J.T. : Incidence of Meniscal Injury and Chondral Pathology in Anterior Tibial Spine Fractures of Children. J Pediatr Orthop. : 35(2): 230-135, March 2015. Mansour, A.A. 3rd, Barsi, J., Baldini, TH, andGeorgopoulos, G.: The effect of different distal fixation augmentationmethods on the pullout strength of Fassier-Duval telescoping rods.Orthopaedics Mar-Apr 39(2):e328-31, doi: 10.3928/01477447-01, Epub March11, 2016. Rhodes, J.,Mansour, A., Frickman, A., Pritchard, B., Flynn, K., Pan, Z., Chang, F., and Miller,N. : Comparison of Allograft and Bovine Xenograft in Calcaneal LengtheningOsteotomy for Flatfoot Deformity in Cerebral Palsy. J. Pediatr. Orthop. [Epub ahead of print], July 2, 2016. Mansour A.,and Kuhn, J.E. “Sternoclavicular Joint Reconstruction using SemitendinosusAutograft”, in Operative Techniques: Shoulder and Elbow Surgery,2011. Mansour A., and Eilert, R.E. “Pediatric fracture principles and growth plate injuries”,in Hak DJ, Ipaktchi KR, and Morgan S, (authors): OrthopaedicTrauma Call for the Attending Surgeon, SlackIncorporated Publisher, March 2013. Mansour, A, Chauvin, S.W., Scott, J.R., and Yang T, “Students’ Beliefs aboutMentoring and their Self-Reported Use of Mentoring Resources at LSU Schoolof Medicine at New Orleans.” Oral presentation at the Annual Meeting of theSouthern Group on Educational Affairs/Southern Group on Student Affairs,Association of American Medical Colleges, Winston Salem, North Carolina,April 7-10, 2005. Mansour A.,Even, J., Phillips, S., and Halpern, J., “Risk of ConjunctivalContamination is Significantly Decreased with Appropriate Eye Protection,”Podium presentation at 008 OTA National Meeting, Denver, Colorado, October15-18, 2008. Mansour A.,Even, J., Phillips, S., and Halpern, J., “Risk of ConjunctivalContamination is Significantly Decreased with Appropriate Eye Protection,”Chosen as a 2008 OTA Annual Meeting Highlight paper and selected for Podiumpresentation at 2009 AAOS National Meeting, Las Vegas, Nevada, February 28,2009. Mansour, A.,Miller, N., Davies, K., and Chang, F., “Allograft versus bovine xenograftin calcaneal lengthening osteotomy for planovalgus foot deformity incerebral palsy,” Podium presentation at The Children's Hospital AnnualOrthopaedic Day, University of Colorado, Aurora, Colorado, April 22, 2011. Immature Patient,” Podium presentation at The Children's Hospital AnnualOrthopeadic Day, University of Colorado, Aurora, Colorado, April 22, 2011. Schlegel, T., Mansour, A., Shanley, E., Hawkins, R., andThigpen, C., “Humeral Torsion but not Shoulder Range of Motion is Alteredin Elite Quarterbacks participating in the 2010-2011 NFL Combine,” Podiumpresentation at 2012 NFL Team Physicians Scientific Session at 2012 NFLCombine, Indianapolis, Indiana, February 24, 2012. Sjostrom, R., Irion, B., Hotchkiss, M., Rhodes, J., Vidal, A., Mansour, A., and Stewart, J., “Incidence of Meniscal Tearsand Chondral lesions in Anterior Tibial Spine Fractures of Children,”Podium presentation at The Children's Hospital Annual Orthopaedic Day,University of Colorado, Aurora, Colorado, April 6, 2012. Pinksi, S., Mansour, A., Baldini, T., Wolcott, M., Vidal,A., and Hadley-Miller, N., “Biomechanics of Two Physeal-Sparing ACLReconstruction Techniques: A Cadaver Study,” Podium presentation at 2012POSNA National Meeting, Denver, Colorado. May 16-19, 2012. Mansour, A., Barsi, J., Baldini, T., and Georgopoulos, G., “Biomechanical comparison ofaugmented distal fixation of Fassier-Duval telescoping rods,” Symposiumpresentation at 2012 POSNA National Meeting, Denver, Colorado, May 16-19,2012. Mansour, A.,Schlegel, C., and Schlegel, T., “Scarring of the Anterior Interval of theKnee after ACL Reconstruction: Results after Anterior Interval Release,”Podium presentation at 3rd Annual Denver Sports Medicine FellowsResearch Symposium, Denver, Colorado, June 20, 2012. Mansour, A.,Porter, David A., Young, Jason Paul, Hammer, Dave, Boublik Martin,Schlegel, and Theodore F., “Corticosteriod Injections Hasten Return to Playof National Football League Players Following Stable Angle SyndesmosisSprains,” Podium presentation at American Orthopaedic Society for SportsMedicine (AOSSM) 13th Annual Meeting, Chicago, Illinois, July12, 2013. Mitchell, J., Mansour, A., et al., “Incidence of MeniscalInjury and Chondral Pathology in Anterior Tibial Spine Fractures ofChildren”, Podium presentation at 2014 Western Orthopaedic Association’sAnnual Meeting, Big Island, Hawaii, June 30-August 2, 2014. Chauvin, S.W., Yang, T., Mansour, A., Cauble, S., andLohmann-Bigelow, J., “Examining Perceptions about Mentoring Across MedicalStudent Levels in One School.” Poster presentation at the AmericanFederation of Medical Research and Participating Southern SocietiesRegional Meeting, New Orleans, Louisiana, February 24-26, 2005. Mansour, A., Cauble, S., Lohmann-Bigelow, J., Yang, T., and Chauvin, S.W., “MakingConnections: A Student-run Web-Based Mentoring Program at LSU School ofMedicine.” Poster presentation at the annual meeting of the Southern Groupon Educational Affairs/Southern Group on Student Affairs - Association ofAmerican Medical Colleges, Winston Salem, North Carolina, April 7-10, 2005. Mansour, A.,Schwartz, H.S., Hatmaker, A., Delbeke, D., and Kelley, M., “MusculoskeletalFindings on FDG-PET-CT Scans Performed for Melanoma Staging,” Posterpresentation at 2008 Orthopaedic Research Society Annual Meeting, SanFrancisco, California. March 2-5, 2008. Mansour, A.,Even, J., Phillips, S., and Halpern, J., ”Risk of ConjunctivalContamination is Significantly Decreased with Appropriate Eye Protection,”Poster presentation at 2008 Vanderbilt HSAC Annual Research Forum,Nashville, Tennessee. April 23-24, 2008. Mansour, A.,Wilmoth, J., Mansour A.S., Mencio, G., Lovejoy, S., and Martus, J., “Femurfracture spica casting in OR versus ED: analysis of reduction,complications and cost,” Poster presentation at 2010 POSNA NationalMeeting, Waikoloa, Hawaii, May 4, 2010. Mansour, A.,Davies, K., Miller, N., and Chang, F., “Allograft versus bovine xenograftin calcaneal lengthening osteotomy for planovalgus foot deformity incerebral palsy,” Poster presentation at The Children's Hospital AnnualPediatric Spring Poster Session, Aurora, Colorado, May 20, 2011. Mansour, A.,Davies, K., Miller, N., and Chang, F., “Comparison of Allograft and BovineXenograft in Calcaneal Lengthening Osteotomy for Flatfoot Deformity inCerebral Palsy,” Poster presentation at 2012 POSNA National Meeting,Denver, Colorado, May 16-19, 2012. Mansour, A., Ballard, R., Garg, S., Baulesh, D., and Erickson, M., “The Use of BarbedSutures During Scoliosis Fusion Wound Closure: a Quality ImprovementAnalysis,” accepted for Poster presentation at 2012 Scoliosis ResearchSociety National Meeting, Chicago, Illinois, September 5-8, 2012. Sjostrom, R., Mitchell, Justin, J., Mansour, A. A., Irion, B., Hotchkiss, M., Terhune, E., Carry, P.,Stewart, J.R., Vidal, A.F., and Rhodes, J.T., “Incidence of Meniscal Tearsand Chrondral Pathology in Anterior Tibial Spine Fractures of Children,”accepted for ePoster presentation at 2013 POSNA National Meeting, Toronto,Ontario, Canada, May 1-3, 2013. University of Houston/Memorial Hermann Medical Minute, “ Hip Injuries in Athletes”, Memorial Hermann Memorial City MedicalCenter, Houston, Texas, March 1, 2013. KPRC, Channel 2, Interview, “ Performance-Enhancing Supplements in Youth Athletes”, MemorialHermann Hospital, Houston, Texas, March 6, 2013. Comcast SportsNet-SportsTalk Live Interview, Medical Update: Foster’s Calf Strain, Houston, Texas, May 30,2013. Comcast SportsNet-SportsTalk Live Interview, Medical Update: Dwight Howard’s Back, Houston, Texas, July 18, 2013. Comcast SportsNet-SportsTalk Live Interview, Medical Update: Brennan Williams’ Knee, Houston, Texas, July 25, 2013. “Back to School Safety”, KHOU-Channel 11, Great Day-Medical Monday, Houston, Texas, August 5,2013. Comcast SportsNet-SportsTalk Live Interview,Medical Update:ACL and Achilles Tears, Houston, Texas, August 8, 2013. Comcast SportsNet-SportsTalk Live Interview, Medical Update: Reed and Quessenbery, Houston, Texas, September 5, 2013. Comcast SportsNet-SportsTalk Live Interview, Medical Update: Turf Toe and Bone Bruises, Houston, Texas,September 26, 2013. Comcast SportsNet-SportsTalk Live Interview,Medical Update: Recovering Injuries in Upcoming Super Bowl Players,Houston, Texas, January 30, 2014. Comcast SportsNet-SportsTalk Live Interview, Medical Update: Harvin’s Hip and Thomas’ Achilles, Houston, Texas,May 22, 2014. Comcast SportsNet-SportsTalk Live Interview, Medical Update: Spine Fractures in the Professional Athlete, Skier's Thumb, andBaseball Injuries,Houston, Texas, July 10, 2014. “Raising an Athlete: Preventing Sports Injuries in Children”, MemorialHermann/Children’s Hospital, Houston, Texas, August 13, 2014. Mansour, A. and Podell, K. KUHF-FM Radio Interview, Houston Matters: Student Athlete Injury Prevention, August 21, 2014. Comcast SportsNet-SportsTalk Live Interview, Medical Update: Dislocated Hip, Broken Foot, Houston, Texas,September 25, 2014. Medical Minute: “ Hip Preservation in the Adolescent and Young Adult”, MemorialHermann/Children’s Memorial Hermann Hospital, Houston, Texas. “Acute Management of Orthopaedic Trauma…before ‘The Call’,” VanderbiltUniversity, Department of Pediatric Surgery Trauma Conference, Nashville,Tennessee, November 28, 2007. “Down Syndrome and the Orthopaedic Surgeon,” Orthopaedic Surgery GrandRounds, Department of Orthopaedic Surgery, University of Texas MedicalSchool-Houston, Texas, March 24, 2011. “Knee anatomy and clinical correlation”, Dobie High School 26th AnnualGreater Houston Athletic Trainers Society Student Athletic TrainerWorkshop, Houston, Texas, January 11, 2013. “Orthopaedic Trauma - Ready or Not”, Memorial Hermann Hospital, CombinedAdult-Pediatric Trauma Education Conference, Department of PediatricSurgery, University of Texas Medical School-Houston, Houston, Texas,February 27, 2013. “Pediatric Sports Medicine”, Physical Medicine & RehabilitationAlliance Grand Rounds, Baylor College of Medicine and the University ofTexas Health Science Center-Houston, Houston, Texas, March 22, 2013. “Pediatric Sports Medicine: Some of the Nitty-Gritty”, Pediatric ResidentsNoon Lecture, Department of Pediatrics, University of Texas MedicalSchool-Houston, April 5, 2013. “Juvenile Osteochondritis Dessicans”, Shriners Hospitals for ChildrenSpring Conference, Houston, Texas, April 23, 2013. “Keeping your kid in the game: Comment football injuries and how to preventthem”, Arian Foster Youth Camp 2013, Pearland ISD Stadium, Pearland, Texas,May 4, 2013. “Osteochondritis Dessicans in the Young Athlete”,12th Annual SportsMedicine Update Two-Day Seminar, Minute Maid Park, Houston, Texas, June 10,2013. “Special Things To Know About Pediatric Patients”, Ortho Camp Orientation,Ironman Sports Medicine Institute, Department of Orthopaedic Surgery,University of Texas Medical School-Houston, Houston, Texas, June 24, 2013. “Orthopaedic Injuries in the Burn Patient”, Memorial Hermann Hospital, BurnGrand Rounds, John S. Dunn Sr. Burn Center, Houston, Texas, July 2, 2013. “Juvenile OCD of the Knee”, Pedi Ortho Resident Lecture, Department ofOrthopaedic Surgery, University of Texas Medical School-Houston, July 23,2013. “Surgical Hip Dislocation with Labral Refixation/Repair”, OrthopaedicsResidents Hands-On Lab, Department of Orthopaedic Surgery, University ofTexas Medical School-Houston, January 30, 2014. "Pediatric Sports Medicine: It Will Find You, Like It or Not”, PediatricResidents Noon Conference Lecture, Department of Pediatrics, University ofTexas Medical School-Houston, March 26, 2014. “Pediatric Sports Medicine: Every Child is An Athlete”, Houston PediatricSociety Dinner Meeting, Houston, Texas, April 22, 2014. “FAI/Pelvic Osteotomies”, Pedi Ortho Resident Lecture, Department ofOrthopaedic Surgery, University of Texas Medical School-Houston, May 13,2014. “Pediatric Residents Splinting Conference/Workshop”, Pediatric ResidentsNoon Conference Lecture, Department of Pediatrics, University of TexasMedical School-Houston, June 4, 2014. “Pediatric and Adolescent Issues in Sports Medicine”, Sports MedicineFellows Conference, Department of Orthopaedic Surgery, University of TexasMedical School-Houston, June 18, 2014. Sports Medicine Symposium, L’Auberge Casino Resort, Lake Charles,Louisiana, June 21, 2014. “Advances in the Treatment of Sports-Related Hip Injuries in Young Adults”,2014 Symposium of the Americas, Ironman Sports MedicineInstitute-UTHealth-Children’s Memorial Hermann Hospital, Westin HotelMemorial City, Houston, Texas, July 20, 2014. “Pediatric Fractures”, Pediatric Emergency Medicine Lecture, University ofTexas Medical School-Houston, September 10, 2014. “DDH (Developmental Dysplasia of the Hip)”, Orthopaedic PediatricConference, Department of Orthopaedic Surgery, University of Texas MedicalSchool-Houston, October 14, 2014. “Pediatric Sports Medicine”, Pediatric Grand Rounds, University of TexasMedical School-Houston, October 28, 2014. “Peds Ortho Injuries”, Emergency Medicine Conference, University of TexasMedical School-Houston, November 6, 2014. “Pediatric Sports Medicine and Overuse Injuries”, Orthopaedic PediatricConference, Department of Orthopaedic Surgery, University of Texas MedicalSchool-Houston, January 13, 2015. “Blue Book Lecture: UTMS Pediatric Student Association & SportsMedicine Association Joint Meeting”, Pediatric Student Association,Department of Pediatrics, University of Texas Medical School-Houston,February 11, 2015. “DDH and SCFE“, Pediatric Residents Noon Conference Lecture, Department ofPediatrics, University of Texas Medical School-Houston, February 13, 2015. “Lower Extremity Angular and Torsional Problems”, Orthopaedic PediatricConference, Department of Orthopaedic Surgery, University of Texas MedicalSchool-Houston, April 14, 2015. “Pediatric and Adolescent Issues in Sports Medicine”, Sports MedicineFellows Conference, Department of Orthopaedic Surgery, University of TexasMedical School-Houston, May 20, 2015. “Focused Physical Exams – Children”, DePuy Synthes Institute, University ofTexas Medical School at Houston, OrthoCamp 2015, Houston, Texas, June26-27, 2015. “The Polytraumatized Child”, First Annual EMS Orthopaedic Trauma Symposium,Memorial Hermann Hospital-Texas Medical Center, July 25, 2015. “Evaluation of Acute Hip Pain in Children”, UT Family Medicine Grand RoundsLecture, University of Texas Medical School-Houston, August 19, 2015. “Hip/Femur Fractures”, Orthopaedic Pediatric Lecture, Department ofOrthopaedic Surgery, University of Texas Medical School-Houston, September8, 2015. “Orthopedic Special Considerations of the Pediatric Patient”, PediatricClassroom Agendas, Memorial Hermann Orthopedic and Spine Hospital, Houston,October 21, 2015. “Hip Preservation in the Adolescent and Young Adults”, Norris ConferenceCenter, Department of Orthopaedic Surgery, University of Texas MedicalSchool-Houston, November 6, 2015. “Hip Disorders in Adolescents and Young Adults”, Orthopaedic PediatricLecture, Department of Orthopaedic Surgery, McGovern MedicalSchool-Houston, December 8, 2015. “Pediatric Orthopaedics”, Orthopaedic Resident Pediatric SurgicalSimulation, Department of Orthopaedic Surgery, McGoverrn MedicalSchool-Houston, January 29, 2016. “Orthopaedics Emergencies, Pitfalls, and Tips”, Pediatric EmergencyMedicine Fellows Conference, Department of Orthopaedic Surgery, McGovernMedical School-Houston, February 3, 2016. “Hip Preservation in the Adolescent and Young Adult”, Orthopaedic ResidentEducation Conference, Department of Orthopaedic Surgery, McGovern MedicalSchool-Houston, February 9, 2016. “Pediatric Orthopaedics, Sports Medicine, What?” Pediatric StudentAssociation Bluebook Lecture Series, Department of Orthopaedic Surgery,McGovern Medical School-Houston, February 10, 2016. “Slipped Capital Femoral Epiphysis”, Orthpaedic Pediatric Lecture,Department of Orthopaedic Surgery, McGovern Medical School-Houston, March8, 2016. “Elbow Trauma”, Orthopaedic Resident Education Conference, Department ofOrthopaedic Surgery, McGovern Medical School-Houston, March 25, 2016. “Pediatric Sports Medicine: It will find you, like it or not”, OrthopaedicResident Education Conference, Department of Orthopaedic Surgery, McGovernMedical School-Houston, March 30, 2016. “Pediatric Ortho Potpourri Case Conference”, Orthopaedic Pediatric Lecture,Department of Orthopaedics Surgery, McGovern Medical School-Houston, May10, 2016. “ABOS Part II Exam; Pearls and Pitfalls”, Department of OrthopaedicSurgery, McGovern Medical School-Houston, May 12, 2016. “Hip Arthroscopy”, Orthopaedic Resident Education Conference, Department ofOrthopaedics Surgery, McGovern Medical School-Houston, June 9, 2016. HealthDay’s Physicians Briefing – Interview: “Corticosteroid injections forankle sprains”, July 13, 2013. Children’s Memorial Hermann Hospital, “Sports-relatedinjuries in adolescents”, Houston Lifestyles and Homes Magazine, FamilyHealth, September 2014. “The concussion rate may be rising among adolescents”, July 12, 2016, RobGoodier. Collaborative Partnership in Sports Medicine/Science, The University ofTexas Health Science Center-Medical School, Department of OrthopaedicSurgery, Pediatric Orthopaedic Surgery and Sports Medicine, Houston, Texas,in collaboration with the Figi National University, College of Medicine,Nursing, Health Sciences, Figi Islands, March 28 – April 12, 2014.